“In recent decades the graphic memoir has emerged as one of the most successful genres of alternative comics. These works address real experiences ranging from war and persecution to migration and discrimination. 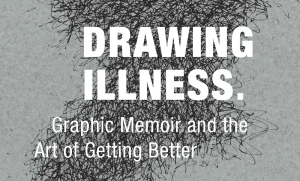 Graphic illness writing, as a major sub-genre, tells of personal encounters with physical and mental illness. The comics form is particularly well-suited to express highly emotional experiences of personal crisis and trauma. The abstraction of the cartoon drawing style, as well as, the blanks in between panels for the readers to fill, enable artists to visualize experiences that elude other media.